Here is my third Varied Vases card. Same layout but a different look. I've taken my colour scheme from the new Sea of Textures Designer Series Paper. It co-ordinates with an ocean-themed set, but I think it works equally well for flowers. I stamped the flowers in Black Stazon and watercoloured them with a Blender Pen and ink. I punched the vases from the same DSP, but this time I've used the deeper-toned sides. It's difficult to tell from the pic, but I also made the vases glossy by pressing the pieces into my Versamark inkpad and sprinkling with clear embossing powder and heat setting. It makes them look almost ceramic. 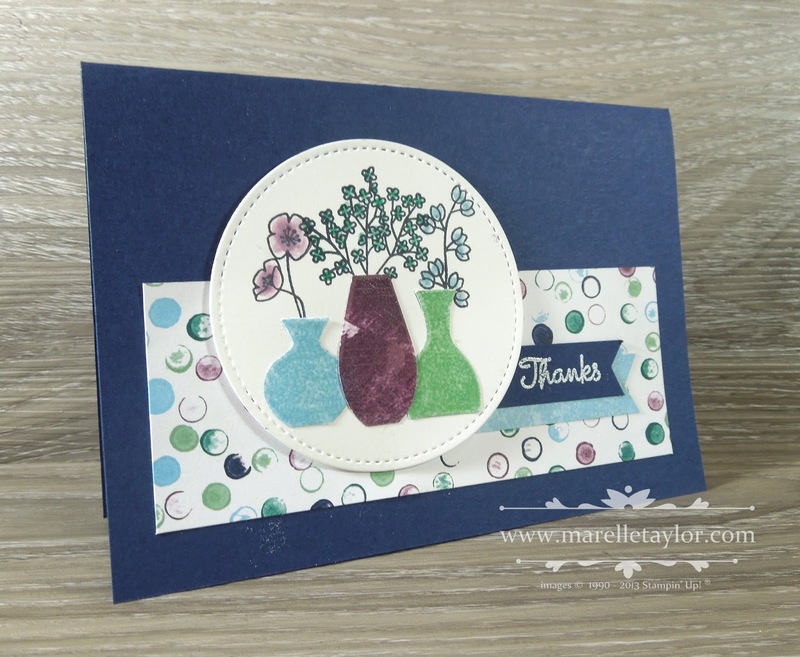 I hope you have enjoyed seeing my Varied Vases cards. I'll be definitely playing a lot more with this bundle!